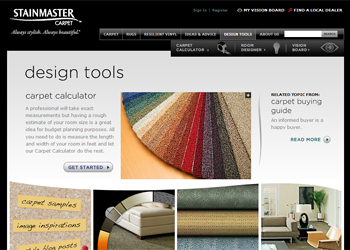 STAINMASTER� carpet leads the industry in the fiber innovations that result in new carpet fashions. Half of all new carpet styles introduced each year come from STAINMASTER� carpet. STAINMASTER� carpet with Tactesse� nylon fiber is even softer and richer than wool, for luxury and fashion with durability. STAINMASTER� carpet is made exclusively of STAINMASTER� Type 6,6, nylon fiber, the strongest and most resilient carpet fiber available. STAINMASTER� carpet with STAINMASTER� Type nylon 6,6 fiber stands up to household traffic and looks better longer than any other type of carpet. Built-in static protection to eliminate static shock for the life of the carpet was invented by the providers of STAINMASTER� carpet and is found in all carpets carrying the STAINMASTER name. STAINMASTER� carpet provides the most comprehensive warranties in the industry.